OPI My Address is "Hollywood"
This is 3 coats of OPI A Good Man-darin is Hard to Find, a bright, red-based orange creme, and one coat of Sally Hansen Insta-Dri topcoat. I have swatched this polish in the past, when I reviewed the collection, but I have never actually worn it as a manicure. Honestly, I was never really taken with the color, as when I swatched it, I didn't really like it with my skintone. However, I was taking my youngest nephew out for his birthday on Saturday, and I needed a bright orange-ish polish to go with the outfit I had in mind. A Good Man-darin... came immediately to mind. And after applying it, I must say that my first impression was not the right one. I loved this polish with my skin-tone. Yes, it's an orange (which sometimes doesn't look so great with my pink skin), but this one worked, probably because of the red in the base. At any rate, it's a fantastic color and I can really see me wearing more of it this summer. The formula on this one was good, better than good actually. I had no issues with application, but I did need 3 coats to reach fully opacity. Though, if you wore a sticky base coat (which admittedly, I stubbornly refuse to wear) you could probably get this one opaque in 2 coats. A Good Man-darin is Hard to Find is from OPI's spring 2010 Hong Kong Collection (I apologize for previously stating 2011... my years are starting to run together :P), and per OPI's website, it is still in their line-up. OPI polishes retail for $8.50 a bottle. I love this polish, it's gorgeous. Looks great on you too! I love the color!!! oh, and what do you mean by "sticky" base? and how come you don't like it? I still consider myself new to all this and I'm trying to learn more!! I don't usually wear a basecoat. I find that it just adds another layer on my nails and is another reason for a polish not to dry. However, if I know a polish is going to stain or if it is especially thin or prone to streaking, I will wear a sticky basecoat. "Sticky" in regards to a basecoat, just means one that dries slightly rubbery or tacky on your nail and helps your polish to better adhere to your nail. There are several out there, but I prefer CND Stickey. 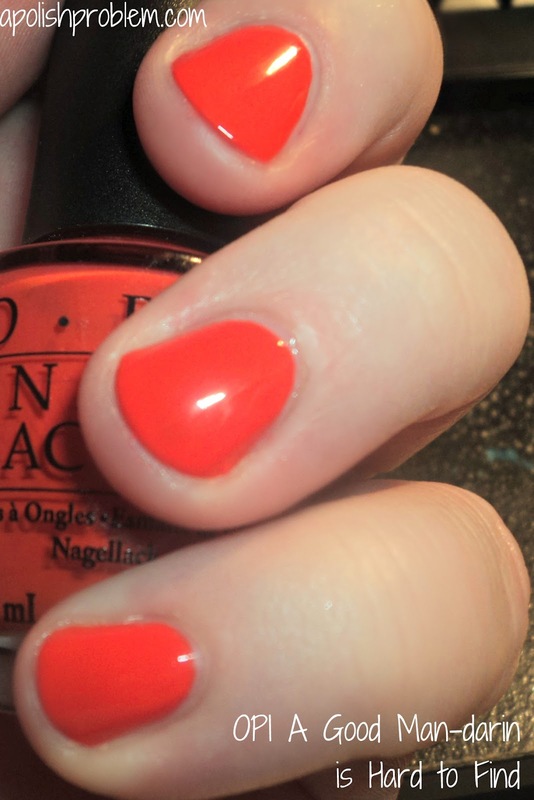 I've also tried Orly Bonder and I just didn't like it.